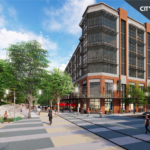 Exciting retail opportunities within historic City Place in Downtown Durham. A new, Class A office building will be developed on-site and the historic building is seeking active retail uses including food/beverage, boutique fitness, coffee, specialty retail, etc. Originally built in 1930 as a City of Durham garage, this unique loft-style building features huge windows, high ceilings, exposed truss ceilings, brick walls and abundant on-site customer parking.